It was Sunday afternoon , around 1:00pm. 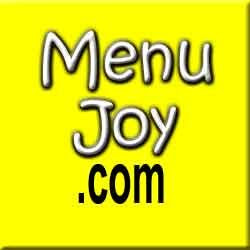 , when I was sitting at the computer , foot encased in ice and elevated from a nasty case of GOUT , that I began exploring area food sites . I came upon one called ACTIVE DINER . It had reviews of local eateries so I looked into pizza shops . 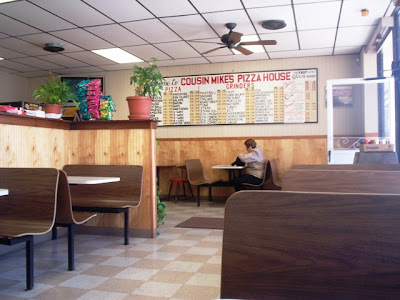 I noticed a tremendous amount of great reviews for COUSIN MIKE'S PIZZA ( which is about 10 minutes from my house ) . 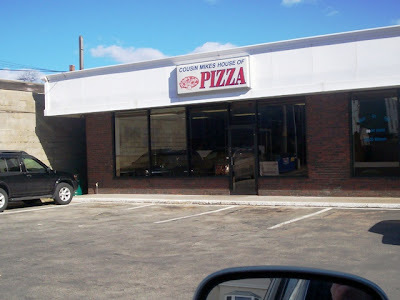 Of course , like all near-by places .....we had never visited there nor tried their pizza . We're weird like that . So I mentioned the place to Laura and told her that the bacon & pineapple pizza was highly recommended by several people . THAT WAS IT ....THE IDEA WAS PLANTED IN HER BRAIN . So by 1:30pm. 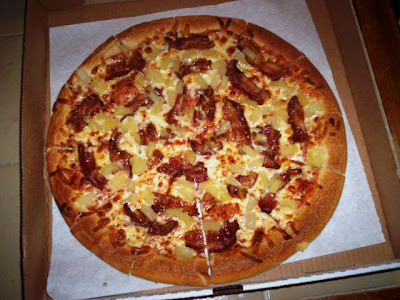 , we had placed an order for a large bacon & pineapple pizza and Laura was out of jammies ....into jeans ....and on her way . We were told it would be ready in 15 minutes ...and it was . It is your typical neighborhood pizza place ......a small counter .....a few booths ....and a large sign with all their goodies posted . Laura found the place to be very neat and clean and the people very friendly . She also managed to score a take-out menu which would be helpful for future orders . A word of warning .......they DO NOT deliver ....eat-in or pick-up only ......but we quickly found out it's worth the trip . The pizza was delicious . 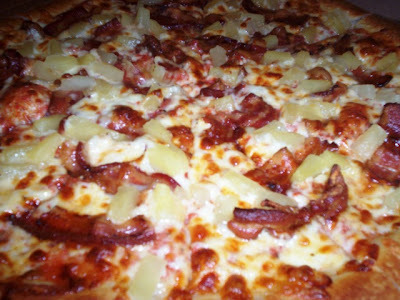 The marriage of the meaty , salty bacon and the sweet , fresh pineapple was made in heaven . The crust was thin but not cracker - thin ....and had a nice crisp rim . This was a really tasty pizza . Even hubby ( who has been very fussy lately .....male menopause ) enjoyed his slices . The pie was quite large and they cut it into several small slices .....which made it so nice and neat to pick up . I couldn't wait to see what else they offered . They have all manner of pizzas , with multiple combos and numerous toppings . A few unusual toppings available ......salami , eggplant , pastrami , anchovies plus the popular ....chourico , peppers , pepperoni , chicken etc. They come in 2 sizes ....small for around $ 6.00 and large ....for around $ 10.00 . Then there are the combos .....combo of 2 ....$ 11.74 .....3...$ 12.50 .....4...$ 13.50 etc. They also carry mini cheese pita pizzas ......$ 2.95 . 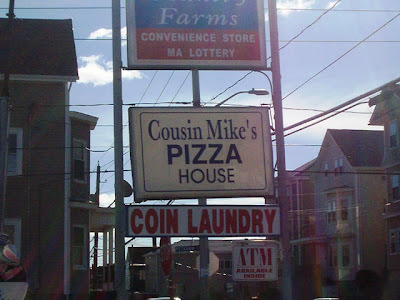 And the GRAND-DADDY ...the COUSIN MIKE'S SPECIAL ......$ 16.85 ...must be everything but the kitchen sink . They also offer dinners like .....fish&chips ....$ 7.75 .......spaghetti / with either chicken/meatballs/sausage/mushrooms/veal .... from $ 6.50 - $ 7.75 ......hamburger platter ....$ 5.75 ....fried chicken ....$ 7.75 and others . Plus they have club sandwiches , salads , steak subs , all your favorite grinders (even a GYRO - $6.50 ) and also a selection of omelet grinders ....you know ....chourico&egg, steak&egg, bacon&egg etc. These run $ 4.00 for a small and $ 5.50 for a large . They also have a nice selection of appetizers ......buffalo wings / boneless ....jalapeno poppers ....mozzarella sticks ....fries , onion rings etc. These run from $ 2.75 - $ 7.50 . Since we all enjoyed our pizza so much ....we'll definitely be trying other things .....like that chourico&egg grinder .....or the Greek salad ....or the steak combo or ...........etc. etc. etc. Whatever ....it will be worth it to get off the couch ( or get Laura off the couch ) and go pick up something delish !!!! HOURS : Mon. - Thurs. ----11:00am. - 10:00pm. Fri. - Sat . ---------11:00am. - 10:00pm.